TRUE NORTH SPORTS - As part of the NHL's "This is Hockey" initiative, which promotes diversity and inclusiveness in hockey, True North Sports + Entertainment will host two hockey games that celebrate Indigenous culture in Manitoba: Winnipeg Jets WASAC (Winnipeg Aboriginal Sport Achievement Centre) Night on Saturday, Feb. 16, and Manitoba Moose Follow Your Dreams Day on Sunday, Feb. 17. This is Hockey promotes hockey as a sport for everyone and the need to provide a safe and inclusive environment for everyone in the community to both play and enjoy. To celebrate each of these special games, True North has collaborated with Red River College graphic design student Leticia Spence, from Pimicikamak First Nation (Cross Lake, Manitoba), to develop a special version of both the Winnipeg Jets and Manitoba Moose logos that incorporate the artwork and symbolism of several Indigenous cultures, including her own Cree heritage. T-shirts with each logo will be sold on the concourse at each of their respective games on Feb. 16 and 17 with proceeds going toward WASAC. On Feb. 16, as part of WASAC Night, the Winnipeg Jets will welcome 30 Indigenous youth from remote and northern communities including Lac Brochet, Oxford House, Pauingassi, and Shamattawa, providing them with the rare chance to experience a professional hockey game. 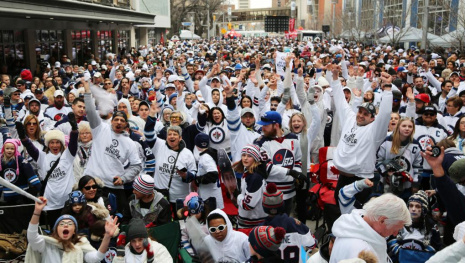 These students will write about their experiences participating in this unique opportunity with True North and what the Jets mean to their community. Their full experience will include taking in the Winnipeg Jets and Ottawa Senators gameday skates and skating with Indigenous NHL alumni Reggie Leach, Jamie Leach, and Daryl Stanley at Camp Manitou before returning to Bell MTS Place for the game. WASAC Night will feature local Indigenous country and folk singer Don Amero singing the national anthem, drumming group Spirit Sands Singers, and a ceremonial puck drop featuring Indigenous youth and elders. Manitoba Moose Follow Your Dreams Day will welcome 500 youth from Indigenous communities throughout Manitoba. Students will have an exclusive opportunity to take part in a meet and greet/Q & A session with Indigenous NHL alumni Reggie Leach, Jamie Leach, and Daryl Stanley before attending the Moose 2 p.m. matchup vs. the Milwaukee Admirals. Moose fans will also be treated to drumming from the Spirit Sands Singers. Tickets to WASAC Night and Follow Your Dreams Day are available at winnipegjets.com/tickets and moosehockey.com/tickets.